No Brakes Games was established in 2012 and have released a couple of games for mobile including 2013's No Brakes Rally (a Windows Phone game, would you believe, which involves racing on tracks based on real maps provided by Bing), 2013's Pocket Sheep (a casual sheep herding game on iOS and Windows) and 2015's Signals: Lockdown (a Windows 10 exclusive hacking game which involves soldering components with your fingers). 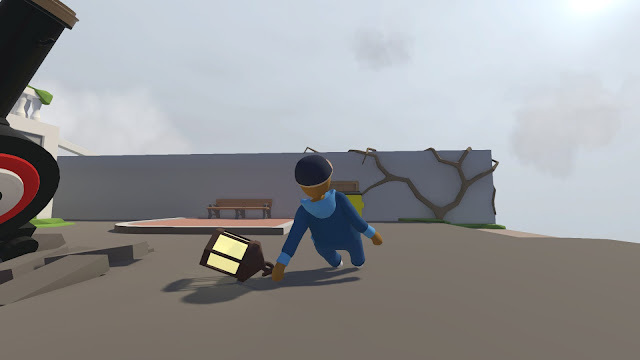 In 2016, No Brakes Games released an open-ended physics-based puzzle game called Human: Fall Flat. In the game you take control of a character (who is apparently called "Bob") and his job is to solve puzzles. In order to progress through the levels, you'll be able to take control of Bob's limbs in order to interact with the environment, whether it's pushing buttons, pulling doors open, carrying boulders or climbing walls: this is what the game is about. Back in August of 2017, I purchased the Humble Jumbo Bundle 9 which included a whole bunch of games such as American Truck Simulator, Vermintide, The Flame in the Flood and, of course, Human: Fall Flat. While Human: Fall Flat wasn't one of the main reasons I went for the bundle, I heard good things about it not to mention the game is rated well on Steam with a 90% of the 14,921 user reviews being positive which equates to a "Very Positive" rating. The game also appeared to be family friendly and have local co-op, another two important reasons I wanted to give it a go with my daughter on the Steam Link. Occasionally you'll come across some tutorial videos that demonstrate how to play the game. They're humourous and fit in with the light-hearted tone of the game. If you love slapstick, there's a good chance you'll love this game, even if you can't solve any of the puzzles. How do I know this? Because my 5-year-old daughter does exactly that; not interested in actually solving the game's puzzles, she just spends her time making sure that the humans indeed fall flat on their faces and hilarity ensues. Admittedly, I too found it kind of funny for the first 10 minutes, but slapstick isn't really my sort of humour so it got old quick (but it might not for you). The game allows you to customise your character or "Bob" with a variety of clothes and faces; you can even import your own face if you have a webcam installed. The game works perfectly on Steam Link and you can play local split-screen co-op. You're also able to play the game online with up to 8 players if you don't have any friends to play with at home or you're seeking a bigger group to tackle the levels. The game has 51 Steam achievements you can earn and 7 Trading Cards to collect. There isn't much to fault about this game except one particular thing and it's unfortunately one that really gets on my nerves: the controls. 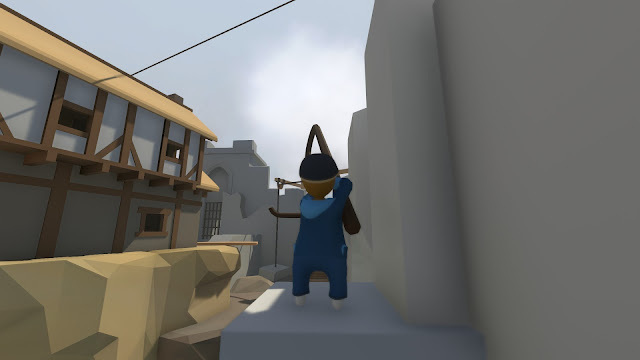 Human: Fall Flat is one of those games where you need to have a lot of patience and dexterity: your mouse controls your head and the keyboard controls your movement which is pretty standard in FPS games but you also have to worry about your left and right arms which are controlled by the mouse buttons. While this might not sound like too much added complexity, it becomes an issue when you try to coordinate multiple keys (or worse, controller buttons) at once, especially for those who are uncoordinated like myself. It's even worse when it's a puzzle that requires some dexterity like trying to hang a metal bar on a hook while jumping in mid-air. What makes things extra infuriating is that you know what needs to be done to solve the puzzle but ensuring the stars align in terms of jumping at the right time, grabbing at the right time and holding things at the right angle will require hours of retrying. Thankfully, it's not on an Octodad or Tea Simulator level of frustration (two games I've dabbled a bit in but haven't reviewed yet) and the level design is sometimes flexible enough for you to find alternate ways to solve them (e.g. for one of them instead of swinging across waterfalls with lamps, I instead sidled along a thin ledge around a tower) so it's not all bad. Just be warned, if you lack the time or patience, or you're just terribly uncoordinated, this is not the game for you. 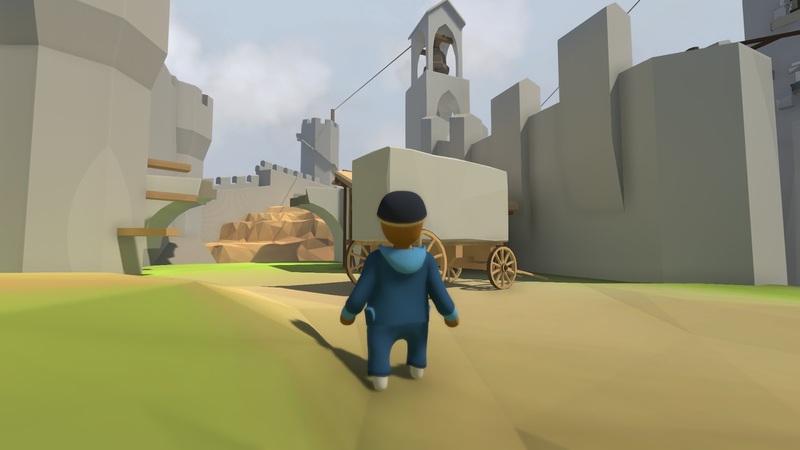 If you're into slapstick, sandbox, physics puzzle games that you can play with your friends and you either have heaps of patience or above average dexterity, then Human: Fall Flat might be worth a try. Otherwise, if you're like me and find games where the solution to the puzzle is obvious but you're incapable to make progress due to a lack of coordination, avoid. Is the game worth $14.99 USD? : Yes, but only if this kind of game is your sort of thing – for me it isn't, so normally I wouldn't even go out of my way to even buy it. If you're into physics-based puzzle games where you like the challenge of controlling multiple limbs, then $20 AUD isn't asking much to give it a go.